After what felt like a massively disappointing summer music-wise, the fall stormed back with a vengance, with a whole slew of great music landing. Here are some highlights from the last few months. As always, you can check out my Favorites of 2012 Spotify playlist, or sample some of my favorites after the jump. * The Avett Brothers - The Carpenter: The Avett Brothers are thisclose to commercial success after their previous album, I and Love and You, blew everyone away. The new album is less rootsy and more commercially viable, which is to be expected, but that is not a slight against it as much as an opportunity for more people to get into this great band. Highlights include the radio single "Live and Die" and "The Once and Future Carpenter." * David Wax Museum - Knock Knock Get Up: I promise I listen to more than just rootsy music, but one of my favorite bands put out a new album recently as well, and it may be their best yet. They fuse indie folk and Mexican folk into a really appealing blend that typically gets stuck in my head for weeks at a time. I promise you'll be singing "Leopard Girl" non-stop by the time you're done reading this, and then you'll just want to start hearing more. * Ben Folds Five - The Sound of the Life of the Mind: Comeback/reunion albums can always be a crapshoot. Gin Blossoms never quite pulled it off, we're still waiting to see how Toad the Wet Sprocket works it out, but the Ben Folds Five reunion always seemed a little expected to me. The good news is that it sounds exactly as you'd expect a Ben Folds Five album to sound, which is both a good and bad thing. The sound hasn't evolved, but it didn't really need to. It's largely back-to-basics for those who hated Reinhold Messner, and for those who may prefer the more "classic" sound, there's plenty of that. Check out the single (with Fraggles) "Do It Anyway" and the NSFW lyrics of my personal favorite, "Draw a Crowd". 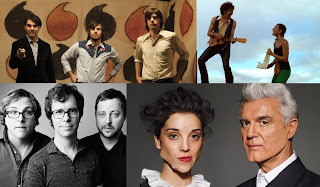 * David Byrne & St Vincent - Love This Giant: You kind of know what you're getting with David Byrne and St Vincent on a basic level - challenging but compelling music. The two of them teaming up sounds great, though - better than either of their individual efforts as of late. I really don't know how to describe it except that it's certainly more Byrne than St Vincent, and that the album as a whole is better than the sum of its parts. That doesn't mean songs like "Who" or "Weekend in the Dust" aren't worthy contenders either.